Zoo just ended its second season last night, but what’s in store for season three? 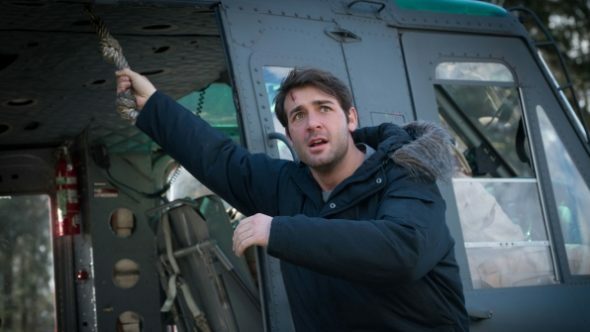 Recently, star James Wolk spoke with Entertainment Weekly about the future of the CBS series. The drama stars Wolk as a zoologist trying to understand why animals have suddenly turned against humans in coordinated attacks. The cast also includes Kristen Connolly, Nonso Anozie, Billy Burke, Josh Salatin, and Alyssa Diaz. What do you think? Do you watch Zoo? Did you enjoy the season two finale? More about: CBS TV shows: canceled or renewed?, Zoo, Zoo: canceled or renewed? Zoo: Cancelled or Renewed for Season Four on CBS? Zoo is so fascinating that I always hold my breath while waiting for the next week’s episode, which then leaves me hankering for the next episode! Please don’t ever cancel this show! We are enjoying the show so much. I hope Mitch won’t be dead. I love all the actors in the show. The story is so interesting. on last few eps of season 2, loved it until the latest eps where “apparently” 100 years ago someone was able to recreate sabre tooth cats!!!! science was not that evolved 100 years ago! its spoilt the story line for me, but I will still watch it. Love it. Can’t wait for season 3. Hope Mitch is alive. Absolutely love Zoo. Thrilled there will be season 3. Fantastic actors, writers, producers!!!! Can’t wait. I live this show. Being in the medical field I find it fascinating to see what new formula is coming next. The crew are amazing ,working together like a family. Dealing with daily obstacles like a family deals with their daily lives. I love the show. I can’t wait for season 3. I have to admit it was good to learn Mitch survived! ! I thought you wrote you were game he wasn’t dead. I was about to reach through this phone and slap you into next June. Hahaha.